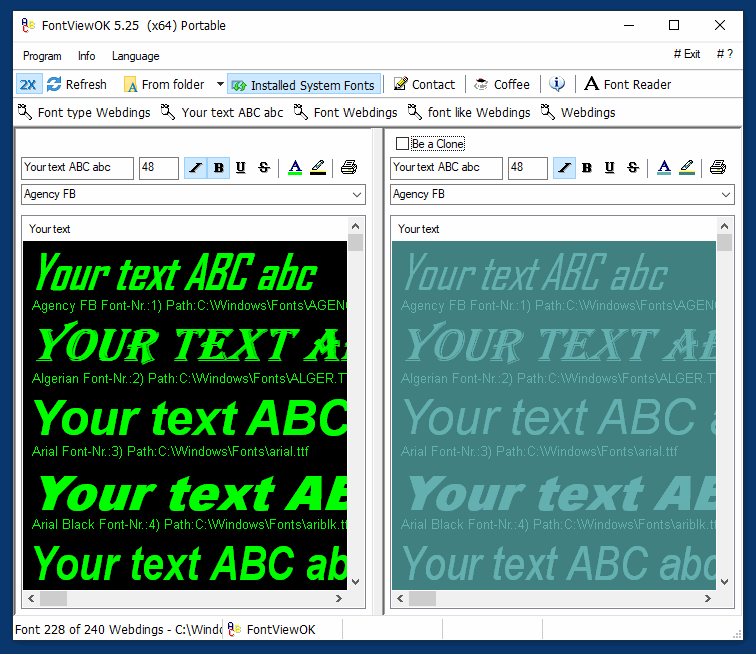 FontViewOK 1.12 Free Download - Only the written form is remembered, but the name is forgotten. FontViewOK help! The problem is well known: Only the written form is remembered, but the name is forgotten.Here helps FontViewOK. He creates a quick visual overview of all installed fonts. The deployment is so simple, a help file is not required. Features: Quick overview of all fonts. Printing with print preview function. Changeable font size, style and color. An installation of FontViewOK is not required. Statement: First, please download the orginal installation package by clicking the download link. Of course you may also download it from the publisher's website. Using FontViewOK crack, key, patch, serial number, registration code, keygen is illegal. The download file hosted at publisher website. We do not provide any download link points to Rapidshare, Hotfile, Depositfiles, Mediafire, Filefactory, etc. or obtained from file sharing programs such as Limewire, Kazaa, Imesh, Ares, BearShare, BitTorrent, WinMX etc. Software piracy is theft. If you like FontViewOK please buy it.